The player was shortlisted for Hurler of the Year in 2013. PODGE COLLINS IS set to make a return for the Clare hurlers, according to reports. Collins was not part of the side’s most recent campaign, after it was suggested that his insistence on also representing Clare’s footballers would impact on his performance. However, a report in The Clare Champion suggests the management have made a u-turn on their previous decision and will welcome Collins back on to the panel in 2016. The player, who was shortlisted for Hurler of the Year in 2013, is currently recovering from a cruciate ligament injury. Clare’s management have refused to comment publicly on these rumours. Email “Podge Collins set to return for Clare hurlers -- reports”. 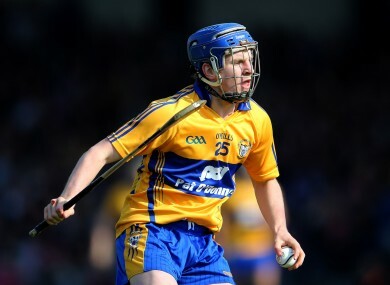 Feedback on “Podge Collins set to return for Clare hurlers -- reports”.